(AP) --The fuel rods at all six reactors at the stricken Fukushima Dai-ichi complex contain plutonium - better known as fuel for nuclear weapons. While plutonium is more toxic than uranium, other radioactive elements leaking out are likely to be of greater danger to the general public. Only six percent of the fuel rods at the plant's Unit 3 were a mixture of plutonium-239 and uranium-235 when first put into operation. The fuel in other reactors is only uranium, but even there, plutonium is created during the fission process. Plutonium is indeed nasty stuff, especially damaging to lungs and kidneys. It is also less stable than uranium and can more easily spark a dangerous nuclear chain reaction. But plutonium, like uranium, is a heavy element that is not easily dispersed in the air. It is the other byproducts of nuclear power generation, such as radioactive forms of cesium and iodine, that are more prone to spread and cause widespread contamination. Ed Lyman, a physicist at the activist group Union of Concerned Scientists, estimates the fuel in Unit 3 is 5 percent to 10 percent more dangerous than the fuel in the other crippled reactors. Still, it is very unlikely to become packed tightly enough to reach what is known as critical mass and start a chain reaction. The plutonium would qualify as weapons grade only if a large quantity was packed together. When the pellets of uranium dioxide inside the thin fuel rods are split to create energy in the reactor, they release neutrons that, in turn, create highly radioactive plutonium-239. This is the same type of plutonium used to make nuclear weapons. This plutonium also splits, creating even more energy. By the end of a uranium fuel cycle, 40 percent of the energy produced comes from the splitting of plutonium. The spent fuel rod that remains at the end of the process contains uranium, plutonium, and a cocktail of other poisonous and radioactive byproducts. 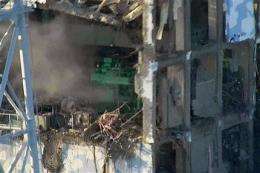 The Fukushima Dai-ichi site has a considerable number of fuel rods on hand, according to information provided Thursday by Toyko Electric Power Co., which owns the atomic complex: There are 3,400 tons of fuel in seven spent fuel pools within the six-reactor plant, including one joint pool storing very old fuel from units 3 and 4. There are 877 tons in five of the reactor cores. Officials have said that the fuel in Unit 4's reactor vessel was transferred to its spent fuel pool when the unit was temporarily shut in November. If plutonium did get out, it wouldn't disappear quickly. Plutonium-239 has a half-life of 25,000 years, meaning it takes that long to lose half of its radioactive potency. Uranium-235 has a half-life of 700 million years. And cesium, which tends to go airborne much more easily, has a half-life of 30 years. Japan has recently built a facility to remove the byproducts and reprocess the plutonium and uranium into a substance called MOX for reuse in its reactors. This was done in part to reduce the amount of spent fuel that is kept onsite at nuclear plants. Japan's reprocessing plant, in Rokkasho, a village 300 miles (500 kilometers) north of Fukushima, is only starting up, and hasn't yet begun full operation. Japan started to use MOX in some of its reactors to learn how it affects plant operations. In general, MOX fuel runs hotter than uranium oxide while inside the reactor. The United States does not reprocess fuel and encourages other countries not to do so because of fears that plutonium recovered in the process could be used to make nuclear weapons.